Unconditional Love. Tough Love. Kevin Love. Former Bruin Star Kevin Love just broke the NBA Post-Merger Record for consecutive Double-Doubles, by notching his 52nd in a row on Wednesday night, in the Minnesota Timberwolves’ 101-75 triumph over the Indiana Pacers. Love finished the game with 21 Points and 16 Rebounds, despite a bruised knee that almost kept him out of the line-up. He injured the knee in his previous game, but Love is nothing if not unconditionally TOUGH, so he played through the pain. He broke the Record before Halftime, getting his 10th Point on the first of 2 Free Throws, which allowed the big announcement to be made during a break in the action, and allowed him a moment to acknowledge the huge ovation that he received. Love also broke a Minnesota Record on this night, when he grabbed his 309th OFFENSIVE Rebound of the Season. Some old-timers might wonder how Love could sit atop the Record Book in this category, when Wilt Chamberlain averaged about 50 & 25 back in the day. Well, Double-Doubles weren’t an “official” stat back then, so this Record goes back only to the MERGER between the NBA and ABA, back in 1976. The Record he broke belonged to Moses Malone, who did it a couple of years after the merger. The next hurdle for Love is Elvin Hayes, who had 55 in 1973-1974 (as Love now goes after the unofficial marks). Besides Love, Hayes and Malone, only 6 other players in NBA History broke the 50-game mark, and Hayes, Malone, and the other 6 are ALL in the NBA Hall of Fame. Not bad company for someone who was warned that he wouldn’t amount to anything in the Pro’s. That’s right — Despite his dominance in College and his Lottery Draft position, some naysayers felt that he was too small to be a successful Power Forward, too unathletic or too slow to defend Pro players, and not a good-enough shooter to score any points. But Love defied his critics, made the All-Star team this year, and wrote his name into the Record Book last night. He’s not the only Bruin who was under-rated as a Pro prospect — Jrue Holiday, Earl Watson, Matt Barnes, Dan Gadzuric, Jason Kapono, Jordan Farmar, Arron Afflalo, Luc Mbah a Moute, Ryan Hollins, and even Darren Collison all had their doubters, and have performed above and beyond their expectations. And speaking of Love’s former teammate Collison, he plays for the Pacers now, so he actually had an up close and personal view of Love’s Record-breaking performance. And speaking of people who used to roam the hallowed halls of Pauley, Steve Lavin got a huge and inexplicable GIFT from NCAA Officials yesterday, as St. John’s squeaked by Rutgers in the Big East Tournament. They were ahead by 2 with 1.7 seconds left, when a St.John’s player stepped out of bounds with the ball. But the Refs thought the game was over, totally missed the player going out of bounds, and signalled instead that the game was over. The horrible call, which replays confirmed as horrible, was NOT reviewed, and the result was final. Afterwards, Lavin acted like he had no idea that it had happened, basically ignoring the interviewer’s question about it. Either he really was clueless, which would be no big surprise, OR, he KNEW that he lucked out big time, and just wanted the controversy to go away quickly and quietly. Ignorant or disingenuous — you make the call. 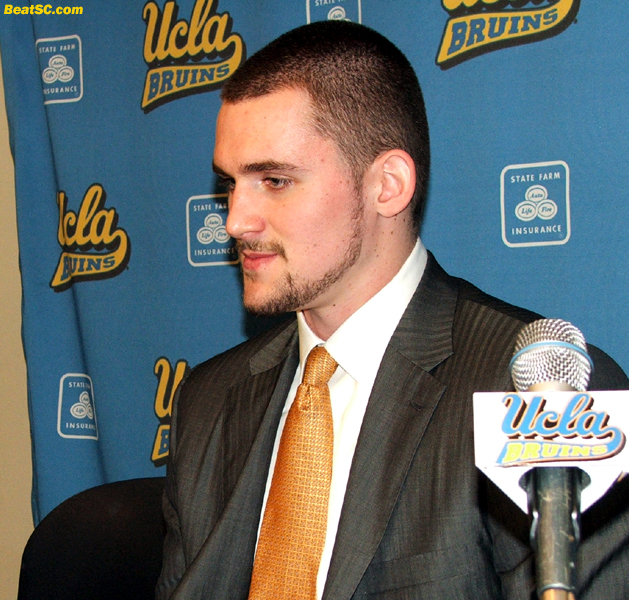 "HIGHER LOVE" was published on March 10th, 2011 and is listed in Blue & Gold News, UCLA/usc/Sports Photos. good point. as for speed of commenting – purely coincidence. sometimes i don’t visit the site for days at a time, but i must have visited right after you posted. thanks again for all your efforts to keep your readership happy!